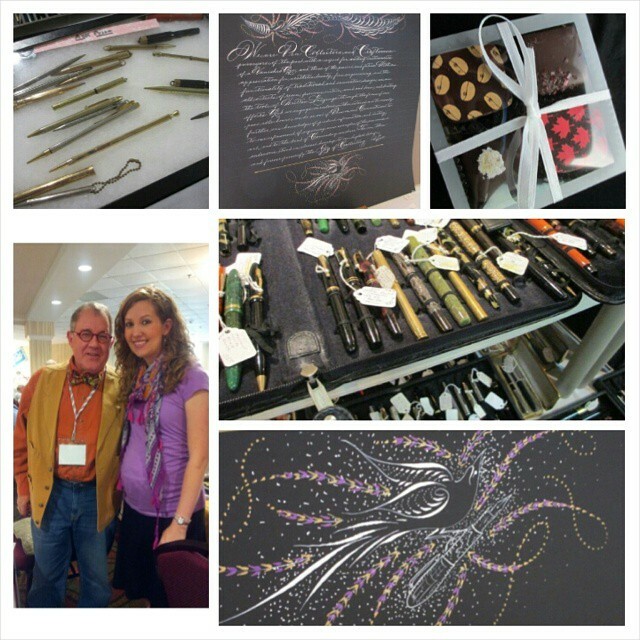 This past weekend was the Dallas Pen Show! My husband and I took the afternoon to view the huge display of fountain pens, from vintage to brand new. It was quite fun! The highlight was seeing my good friend and calligraphy mentor, Michael Sull, who was also a vendor at the show. Every summer we’ll usually catch up at the IAMPETH convention; this year I was not able to attend, so it was such a TREAT to see him right here in Dallas! He designed the lovely piece on black paper for the silent auction. His graceful Spencerian lettering, and those beautiful flourishes, never cease to inspire me. Oh yes, and we bought a bit of delicious gourmet chocolate!